In this video you'll learn how to use the next costume block to change the appearance of the sprite. The sprite, in this case your model can have more than one appearance. These different appearances are called costumes. Changing a sprites costume can change it's appearance slightly or so much that it looks like an entirely different character or object. Select the sprite in your project and click the costumes tab. You'll see that the starter project already includes four different costumes. If you click on each of the costumes, the sprite on the stage changes into an entirely different character. If you run the code while on the costumes tab you can switch from one costume to the next to change the character when the sprite moves on and off the screen. You can also switch costumes using a code block. Click the looks menu then select the next costume block. Every time this costume is clicked the sprite changes its look. Drag the next costume block into the forever loop to make the sprite switch costumes before it comes onstage. You can see that the order of the blocks matters. If the next costume block is placed after the glide one second block the sprite will change costumes after gliding onto the stage. Which makes the project look more like a magic show than a fashion walk. If the next costume block comes before the glide one second block the sprite appears to step onto the stage with its entirely new costume already in place. 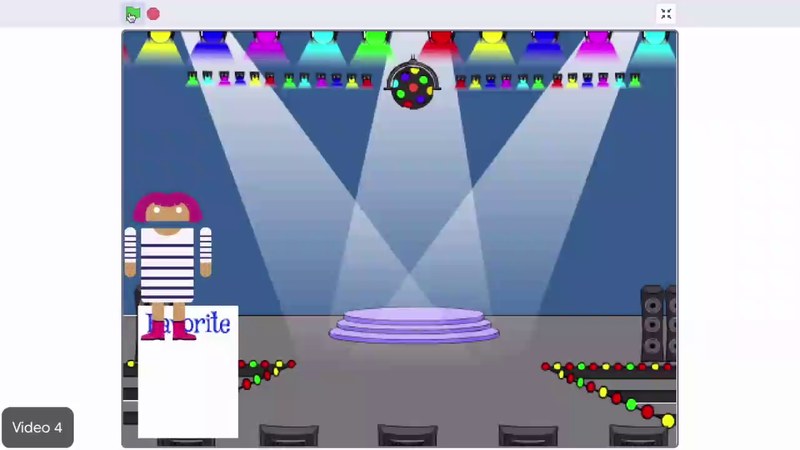 The sprites are running on and off the stage, but in most runway shows the model stops onstage and poses for a moment. From the control menu choose a wait one second block to make the sprite pause on the stage. In scratch you can edit the numbers in the spaces in certain types of blocks to change what happens in your project. For example, changing the value in the glide block makes the sprite move faster or slower. Try changing the value in the wait block to make the sprite pause for a longer or shorter amount of time. Experiment with different values in these fields until you find a behavior and speed that you like. Don't worry if you tested a solution and it didn't work. That happens all the time in computer science. Keep coding, testing, and trying solutions until you find one that works. Lastly, add a when flag clicked block from the events menu to the top of your code stack. Now the code will start running whenever the green flag is clicked. Plus, this starter project had some extra code to start you off. See what happens when you click the green flag. Try clicking on the sprite as it walks across the stage and find out what happens. Make your CS first experience more sociable and fun by sharing what you created today with the Scratch community. Before you go hit the share button and write a description of your project so others on Scratch can enjoy it. Add next costume, wait, and when green flag clicked blocks. When you're done come back to this tab and click the green next arrow to move onto the add-ons page where you can choose different ways to customize your project.